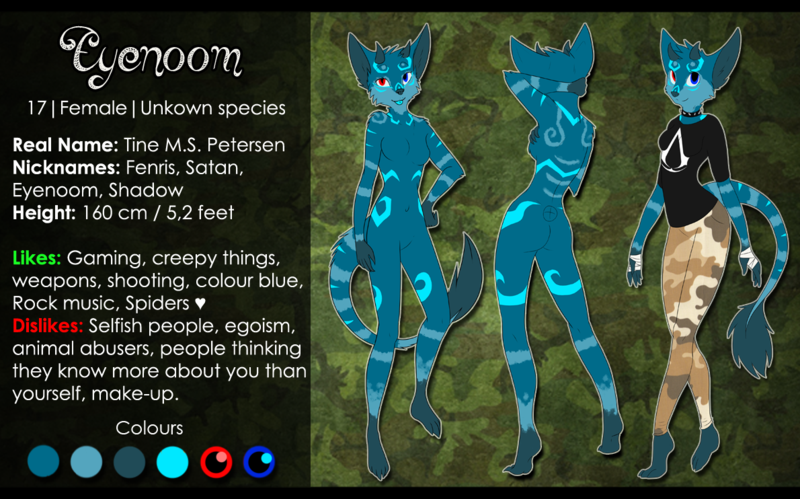 Eyenoom is my fursona and therefore shares personality, prefferences and background story with me. Like me, she suffers from anxiety which cause trustproblems and generally makes her very nervous and uncomfortable when outside. She therefore prefers being inside most of the times, and mostly leave her home only when going to school. Despise the problems caused by anxiety and a rather stressing school, she is generally very happy and satisfied with her life. There's a lot of things she wish she had, but nothing she really needs, beside what she already have. Rather calm and friendly most of the time. Introvert - Enjoys talking with people, but is hesistant with meeting new people. Don't mind spending time on her own with gaming, reading and shooting. Loves deep and respectful discussions and serious talks, but also holds humor very dear and uses it in any situation found fit; Rather comfortable with dark humor. She holds great respect for her friends and family, and trust them - When meeting new people she's respectful and kind, but might be a bit untrusting, if forced into a situation where trust is needed, before she know the person very well. Was born at December 22, 1995 and started in day care shortly after. Had a great love and repect for her childminder which also became a problem when starting in kindergarten at the age of 3,5 years, and had to move on from the day care. In kindergarten she found new and really good friends, many of these are some that she still know and talks a bit with from time to time now. This was also the place she first met Thenmy (This is not her name, but as I'm talking about real people I rather not name any names C:) a new 'enemy' that would kind of shift between enemy and friend as time gone by. She started in school around the age of 6 years together with most of her friends and Thenmy. In school she often ended up in fights with Thenmy, but never considered her a true enemy, as they also had a few good times together from time to time, and stood up for each other if someone else started bothering; Pretty much like a sister. It was a rather little school and had no higher grades than sixth grade, so at the age of 13, she had to move to a bigger school with one of her friends and Thenmy. Some moved to another school named Syddjurs Friskole. But going from a little village-school to a really large one wasen't easy, and she was soon going down with something looking a lot like a depression (It was never confirmed by a doctor, but looking back this is what it looks most like). So in the middle of 8th grade (Age 15) she moved to Syddjurs Friskole as some of her other friends had done, when leaving their old school. Here she got some new great friends, and was reunited with a lot of her old friends. At the age of 16, she finished 9th grade and was therefore done with middle school. Together with one of the new friends she had gotten at Syddjurs Friskole, she decided to move on to HTX, Higher technical Gymnasium/Highschool(Denmark has a bit different system than USA, where our highschool or Gymnasium as it's called in Danish, pretty much resembles the college more.) and have now been there for 1½ year, and will be there for 1½ year more before finishing her Highschool education. She has a lot of familiy. Short fur in blue shades, creating both some natural-shaped markings and some rather unnatural markings, like the bright blue swirls. Her anatomy resembles most that of a cat, but instead of paws, she has more clawlike feet and hands, on her forehead she has two small pointy horns and her tail is long and flexible, more like a dragons. Her eyes are different colors; The left one blue, the right one red. Relaxing clothes; She often buys the clothes one number too large so it's more comfortable and loose. She pics comfyness over beauty and therefore despise most fashion clothes. Is pretty much always seen with something around her neck; Either her collar (Shown on the ref), a little bullet in a metal-chain, or a copy of Sir Francis Drake's ring, as the one Nathan Drake wears in the game-series Uncharted. It's not unlikely to see her wearing bandages around her hands (especially during winter-time) as the cold gives her small cuts all over the hands. She often keeps her STI Combat Master Airsoft gun closeby when at home. Not because an airsoft gun provides much protection, but it makes her feel more safe, and she loves to just pick it up and shoot a bit on some of her shooting targets.